22 May 2016 / 13:04 H.
JERANTUT: Sungai Pahang may most probably lose its historical standing as the longest river in the Peninsula if the authorities do not take firmer measures to address the issue of rampant encroachment of the forest area in Ulu Tembeling. Universiti Teknologi Malaysia (UTM) Faculty of Chemical Engineering lecturer, Professor Maketab Mohamed said: "This is because Sungai Pahang and its brook, Sungai Tembeling are on the 'verge of destruction' and becoming barren as a result of mankind's greed in plundering nature's treasures until the impact is forgotten and brushed aside. "Many relate the cause of the rivers becoming shallow to El Nino ... El Nino this ... El Nino that, global warming and so on. It is true that these things on the global scale hold a certain impact, but to what percentage, is the question. "The pressing issue now is more than that, the domestic factor - management of local water catchment areas. "The impact is now felt by the residents as the water supply from Sungai Kancing is now unable to reach out to Kampung Bantal. "Thus, it is high time that the state government and federal government combine efforts to resolve this issue," he said after participating in the mission rally 'Save the Country's Water Catchment Forests' at Ulu Tembeling recently. The mission was participated by 150 members including environmentalists and academicians, non-governmental organisations like the Association for the Protection of Natural Heritage of Malaysia (PEKA), Environmental Protection Society, Sahabat Alam Malaysia and the Pahang Orang Asli Network. The three-day mission that began last Friday detected activities that clearly indicated unsupervised encroachment of the forest occurring at the Gunung Dulang area, including deforestation using clear cutting method for oil palm cultivation at Sungai Kembir valley. 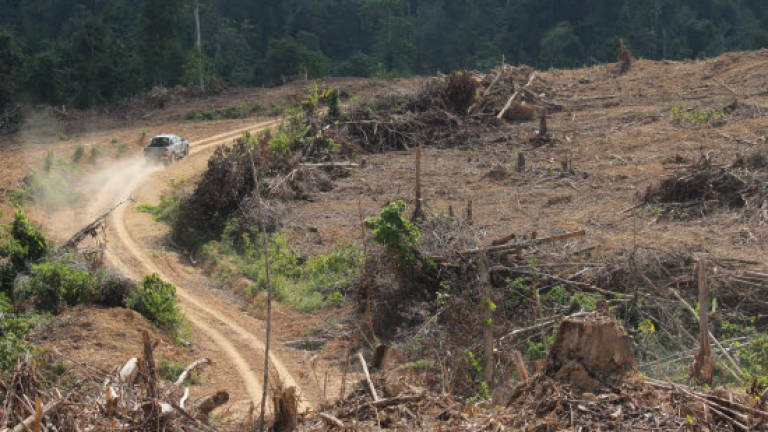 A state government company was found to be responsible for the deforestation activity, and has affected an area of 8,093ha as well as the supply of the natural water catchment area from Sungai Kancing to the villagers in Kampung Mat Daling. Chips of old timber were also found lying in the streams that had clogged them and caused some of these streams to become dry and "dead". It is believed that this factor has also contributed to the blockage in the flow of water to Sungai Tembeling - causing it to become drier and waiting for the moment to "die". Maketab said the impact of the shallow water condition at Sungai Pahang and Sungai Tembeling has not only affected water supply to the residence but has also threatened the ecosystem of the area. "It is not just the quantity of the water that has decreased, but also its quality as it has become murkier, and as such has affected the habitat in the rivers which also takes a toll on the fertilisation of fish there. "As these fish usually fertilise in-between the rocks in the river, so when the rivers become polluted they will not be able to lay their eggs and it will cause their extinction. However, it is still not too late for us to rectify this 'border line' situation," he said. According to him, the current dry condition of both these rivers can only be revived to its normal state within five years from now if proactive steps are taken from this moment. These include the use of smart forest management such as the replanting of trees in areas where the trees have been cut, refraining from planting oil palm on hilly terrains, as well as setting up 50-metre buffer zones from the streams. Meanwhile, Centre for Modern Languages and Human Sciences, Universiti Malaysia Pahang, senior lecturer Dr Hasmadi Hassan said apart from human activities such as logging, the opening of agricultural land, the act of dumping of waste into rivers can also cause rivers to become polluted and shallow. "Similarly, when forest areas became bare and desolate due the encroachment of the forest, for whatever reason, will result in the decline of the efficiency of the forest as a rain catchment area," he said. However, he said, to determine the most dominant factor contributing to the decreasing water level of Sungai Pahang and Sungai Tembeling, thus scientific studies need to be conducted by gathering empirical data, conducting lab tests and hypotheses tests to obtain test results that are academic in nature and significant.